An environmental educator with Friends of the Rappahannock (FOR) is one of 30 young people, ages 30 and under, recently recognized by the North American Association for Environmental Education (NAAEE). The EE 30 Under 30 program highlights the work of young professionals of various backgrounds, ethnicities, genders, and communities who use education to help protect the environment. 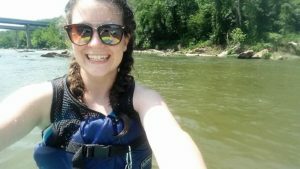 Lowery Pemberton Becker, 27, is FOR’s education coordinator and was chosen as an EE 30 Under 30 individual because of her dedication to Meaningful Watershed Educational Experiences (MWEEs) throughout the tidal Rappahannock River watershed. MWEEs are hands-on, inquiry-based programs where students learn about their impact on their watershed and take action to mitigate those issues. Becker is a Richmond County native and works primarily in FOR’s tidal basin. Since 2013 she has developed and integrated MWEEs into Essex, King George, Lancaster, Middlesex, Northumberland, Richmond and Westmoreland county schools’ sixth grades. Her program includes 25 partner organizations and has reached more than 1,500 students, 82 teachers, and 34 administrators. The EE 30 Under 30 program was started by a partnership between NAAEE and the US Fish & Wildlife Service (USFWS). In 2017, the program expanded its search beyond North America to include international candidates, through support from the Global Environmental Education Partnership (GEEP) and the US Forest Service (USFS). It shines a spotlight on the incredible efforts of young professionals around the world, and motivates others to get involved in environmental education in their communities. All of this year’s finalists use their skills and passion to increase environmental practices and behaviors in their homes, schools, and communities. The 2017 honorees include a mix of backgrounds, projects, and passions. Some are artists and entertainers employing their creative talents to increase environmental awareness. Others have created environmental education programs on their college campuses or joined forces with zoos, aquariums, or parks. And many have founded programs that bring environmental education programming to underserved, indigenous, diverse, and international populations.